The Euro traded below 115 to the US dollar today. I can’t wait to get back to Golden Glow after my week back in the States because it’s in the French side of St Martin, where everything is paid for in Euros or US Dollars. You can bet I won’t be paying for anything in dollars! Last week, I noticed that even when the Euro was around 118 to the dollar, if you paid in US Dollars and asked what currency exchange rate the business was using to calculate the transaction, they were always using at least 125. Phooey! When you buy something denominated in Euros with your US dollars, you multiply the price times the exchange rate, which is now 1.15. As the number drops, the cost in US Dollars comes down. And when you go to the ATM in Europe and exchange your US Dollars, you get more Euros. When the Euro is low compared to the US Dollar, it’s a great time to be spending your US Dollars on goods and services denominated in Euros because you’ll get more value for your dollar than when the Euro/USD number was higher. 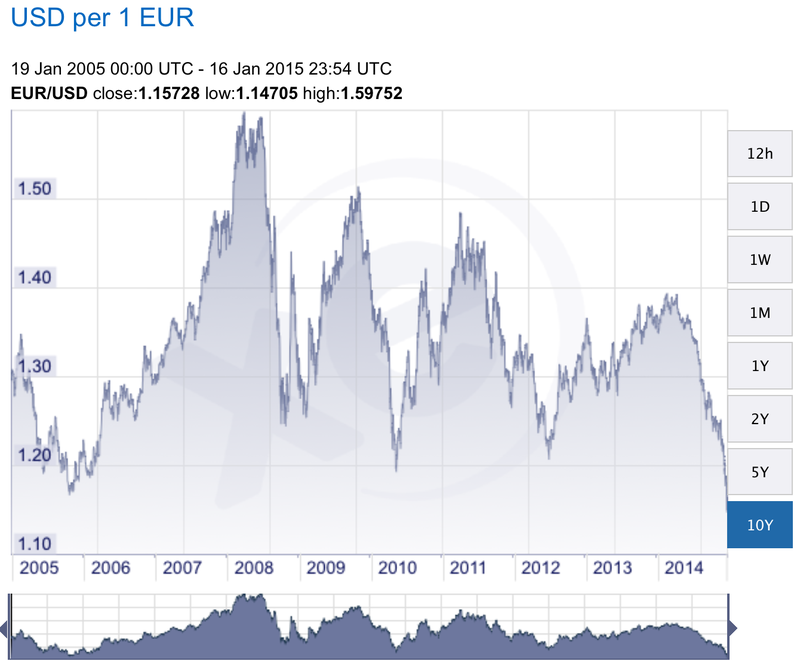 The Euro/USD number hasn’t been this low for 10 years as you can see by the chart to the left. This means it’s a great time to be an American anywhere that has the Euro as its currency. We were already planning to sail through the Mediterranean this summer, and the lower exchange rate should soften the blow from sticker shock in its notoriously pricey ports. You might ask whether today’s low is likely to still be around by summertime. I wish I had a crystal ball, but chances are good that anyone with US Dollars traveling through Euro-denominated countries this summer should get more for their US Dollar money than they used to, and that’s a good thing. On the other hand, don’t expect to get more for your money in Switzerland. Today’s fall in the Euro was due in large part to the fact that Switzerland suddenly unpegged its currency from the Euro yesterday. Swiss Francs promptly jumped in value so everything denominated in Swiss Francs is now considerably more expensive. Some are saying the Euro might even go lower relative to the dollar. Back in August Analysts at Goldman Sachs were predicting that the Euro and the Dollar will be worth the same by the 2017. Germany’s biggest bank, Deutsche Bank, predicts that the Euro will even fall past parity in that amount of time. 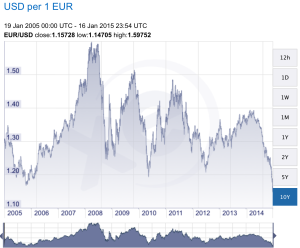 The Euro has been declining in value for a while, and that is not expected to reverse anytime soon. Yes, Mario Draghi and the European Central Bank might tinker with monetary policy and fiscal stimulus, but based on what I’ve been reading, it’s unclear if QE (quantitative easing) will stem the Euro’s fall. Well, this has become a lot more about the Euro than I intended. But all to illustrate the point that is important to cruisers and circumnavigators like us. Going where the local currency is weak relative to your home currency can make a significant difference on your cost of cruising, so it’s worth paying a bit of attention to foreign exchange markets.